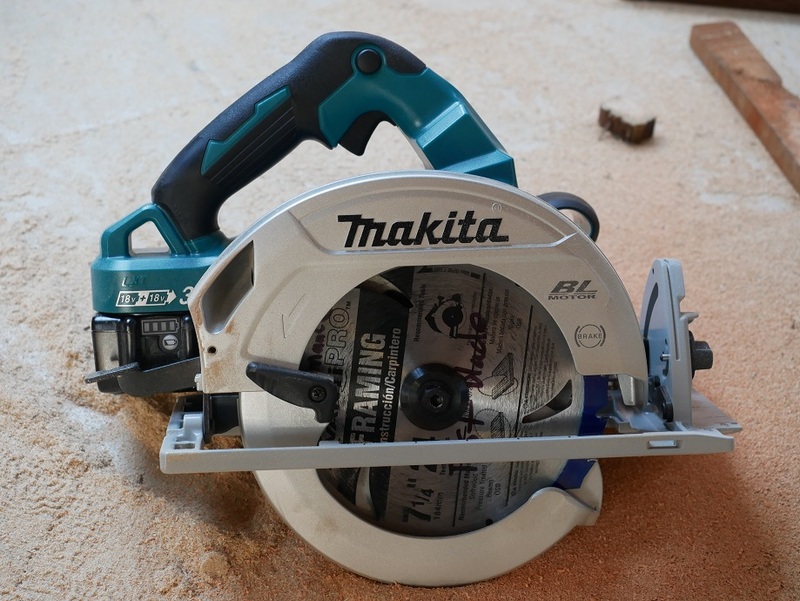 In this review I will be checking out the Makita XSH06Z 18v X2 7-1/4″ Brushless Circular Saw XSH06 XSH06PT and I will provide my honest review of it. I personally purchased the Makita XSH06Z 18v X2 7-1/4″ Brushless Circular Saw XSH06 XSH06PT with my own money. As with all my reviews, I am not paid, sponsored, or obligated to give a positive review. This review is my opinion of the product based on my usage and knowledge and my review will reflect what I like and dislike about the product. I will do my best to provide you with an unbiased review. 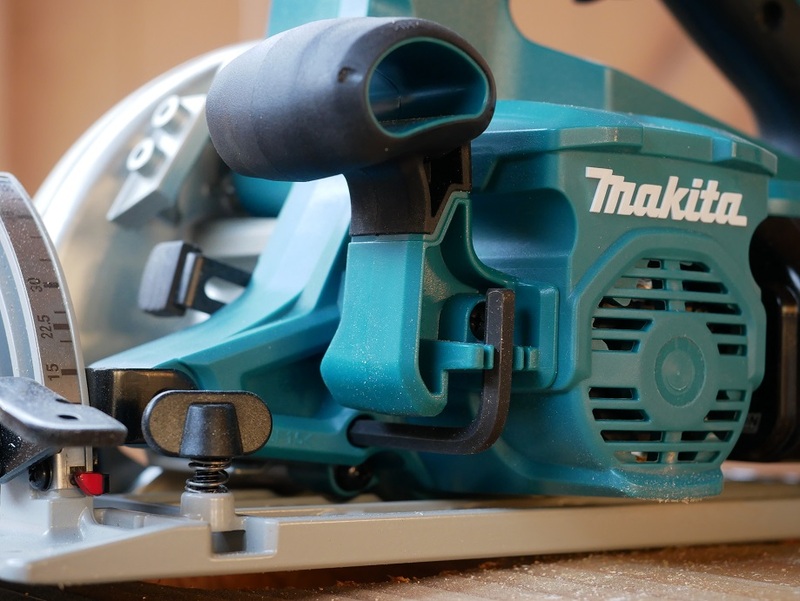 Makita’s original XSH01 X2 7-1/4″ circular saw was by far my favorite cordless circular saw because not only was it able to use regular size 7-1/4″ blades but it also had the performance of a corded saw. Even the mighty Milwaukee M18 Fuel Gen 1 model was powerful for 18V, it was outperformed by Makita’s X2 model simply because 36 volts provides better performance than 18 volts. 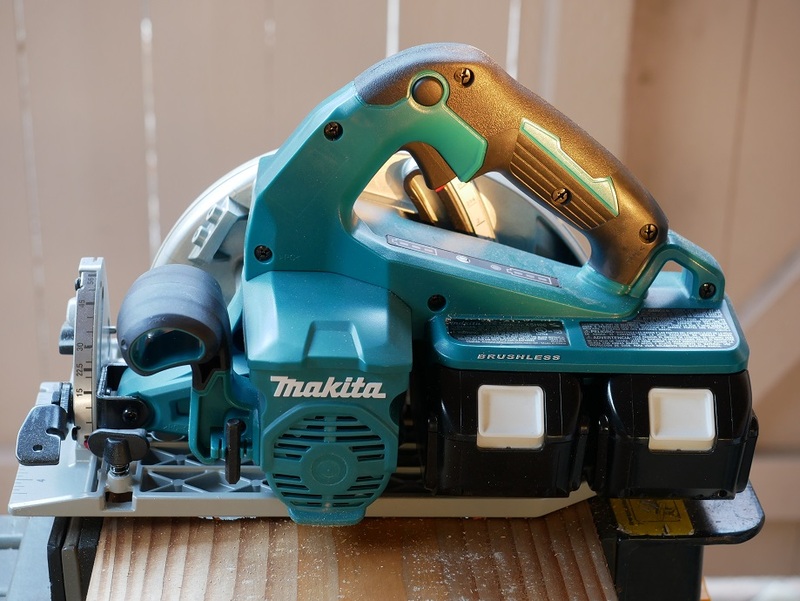 Makita’s original X2 circular saw model uses two 18V batteries to pump out 36 volts while still keeping it in the same 18 volt family of power tools since it uses the same exact batteries as other LXT Makita 18V tools. 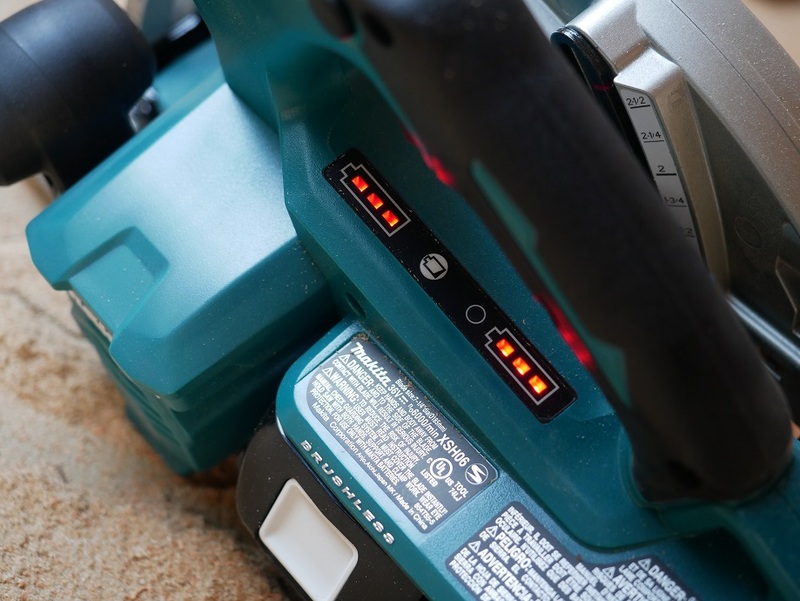 While the Makita XSH01 was an impressive power tool, the cordless market trend was to push everything with a brushless motor. In 2015, Makita released their first brushless cordless circular saw with the XSH03Z however that was still using smaller 6-1/2″ blades. 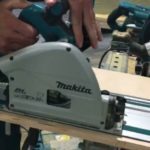 Then in 2017 Makita released a cordless 7-1/4″ circular saw with a brushless motor with the XSR01 which was what they called a “rear handle” model. In other words it was a faux wormdrive that was really a sidewinder disguised to look like a wormdrive. It was by far the most powerful cordless circular saw I tested at the time and was very impressive however in order to make it look like a wormdrive meant they made it bulkier and heavier than it needed to be for a cordless saw as it didn’t have an actual wormdrive drivetrain configuration. I had hoped they would make a cordless 7-1/4″ circular saw with a brushless motor that lived up to what made the original X2 XHS01 great which was it’s powerful motor with a lightweight design and sidewinder configuration and in late 2018 we finally got it with the release of the XSH06 model. The XSH06 model also goes by the name XSH06Z as a baretool and XSH06PT as a kit with a pair of 5.0 ah batteries and dual port charger and tool bag. Like the original XSH01 X2 model, the XSH06 features top notch performance which I’ll go more into detail the performance section of the review below, a large 2-5/8 cutting capacity at 90 degrees, uses 7-1/4″ blades, pumps out 36 volts of performance thanks to it using a pair of 18V batteries together and now features a brushless motor. Brushless motors are more efficient and allow cordless power tools to use less battery power for the same size motor and in some cases can achieve greater performance than brushed motor tools. The XSH06 model uses plenty of magnesium from it’s upper and lower blade guards to its beefy base which is a strong yet light metal and helps keep the overall weight down. It is lighter than Makita’s XSR01 12.4 lbs as the XSH06 comes in at 10.5 lbs with batteries making it almost 2 lbs lighter than their previous juggernaut. Makita managed to make the new XSH06 model just a tad bit heavier than the XSH01 model by 0.4 lbs which is not much. There are several upgrades on the new XSH06 model vs the XSH01 that I appreciate which are a built-in pair of battery fuel gauges so you can check the remaining charge for each battery, they removed the cheap sticker on the front of the shoe base that could fall apart from use and now has no sticker and painted markings instead. Makita should have opted for indented markings for the built in ruler and 0 and 45 degree markings on the front of the shoe as the paint markings can still be scratched off over time if abused. They also added a tether notch so you can use a tether and the saw has a vacuum port accessory that you can add to the side dust chute of the upper blade guard to use a vacuum when cutting. Excellent idea so you have less airborne dust when cutting. They also added the ability to use a rafter hook. Yes you heard right, instead of adding a rafter hook out of the box, they expect you to go out and purchase one if want the functionality instead of including one from the beginning like they did with the rear handle saw and Milwaukee’s M18 Fuel models. What Makita does best compared to other manufactures, is the bevel degree selector knob. Other brands saws have markings of where popular bevel angles are but they leave it to you to make sure you are exactly at said markings. Makita on the other hand has a knob that lets you select and dial in popular bevel angles such as everyone’s favorite 45 degrees along with 22.5 degress and the knob also allows you to select the full bevel angle at 56 degrees so you can choose any bevel degree within it’s range. Once selected, the base stops exactly at the chosen bevel angle thus taking out the guesswork. 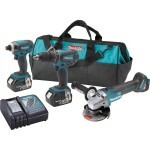 Very nice Makita! One feature that Makita ruined on their rear handle model was by not including onboard storage for their blade change tool but Makita listened to my review of that model and brought back blade change tool storage on this XSH06 model and you can store the included hex key right by the motor housing so it’s by your side at all times. They also brought a modern feature, which is adding an LED light to the saw to illuminate the front of the blade behind the shoe. This is similar to what Milwaukee has been doing on their Fuel models and has the same drawback that hasn’t been addressed, which is that it doesn’t illuminate in front of the shoe! I’ve been complaining about this for years now and yet Manufacturers only care to illuminate the small little window between the blade and the front of the shoe base which only helps the user start the cut in low light but not continue to illuminate the cut line since the light is not shining in front of the saw at the cut line. One feature I didn’t like on this saw was that the second handle used for the left hand is undersized. I have small hands and even then my fingers felt too long and bump into the motor housing of the saw because this second handle is too small. I could only imaging how much smaller it would be for users with larger hands and wonder if you could put up with your fingers awkwardly bending to grip the handle? Simple solution, extend the second handle or make it bigger. At $199 as a baretool and $349 as a kit with a pair of 5.0’s and dual port charger I’d say the price versus value proposition is very good. It’s cheaper than Milwaukee’s 2nd Gen M18 Fuel circular saw which is priced at $249 as a baretool and $399 as a kit with one 12.0 battery and similar to Dewalt’s 60V Flexvolt wormdrive style circular saws pricing of $359 kit with one 9.0 battery but still cheaper than their baretool of $219. Although Dewalt does have a cheaper Flexvolt circular saw option with their original sidewinder circular saw that’s $159 as a baretool or $259 as a one 6.0ah battery kit but is slightly more expensive with the two 6.0 battery kit at $379. Also of interest is that the XSH06 sidewinder is the same price as baretool and kit as the XSR01 model so you really have to decide whether you want a sidewinder or fake wormdrive style sidewinder circular saw from Makita for the same price. 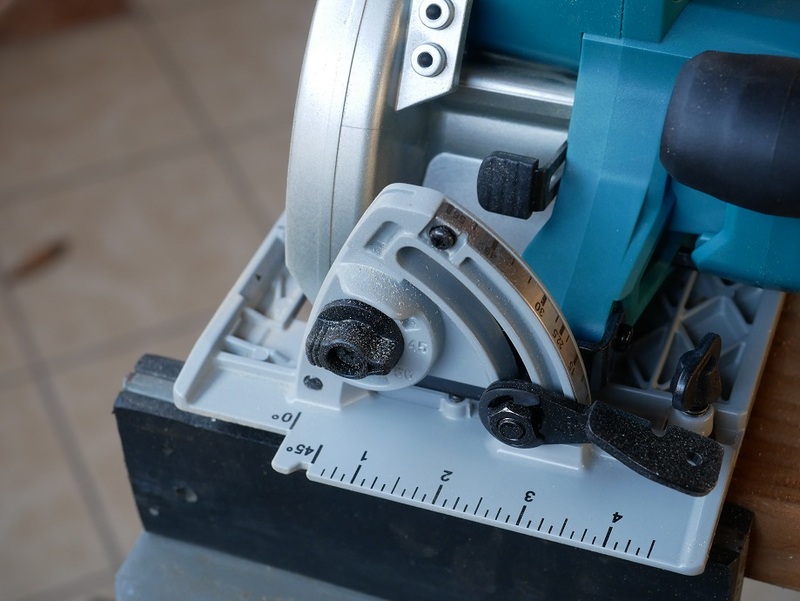 Each Makita X2 circular saw not only offered better performance than their 18V counterparts but also better runtime since it in effect uses two batteries. I was impressed with the 345 2×4 cuts the original XSH01 model had with a pair of 4.0’s and the 458 2×4 cuts the XSR01 made with a pair of 5.0’s. 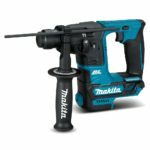 Makita upped the runtime expectations with this XSH06 model with a claimed 610 2×4 cuts which would be outstanding if true. 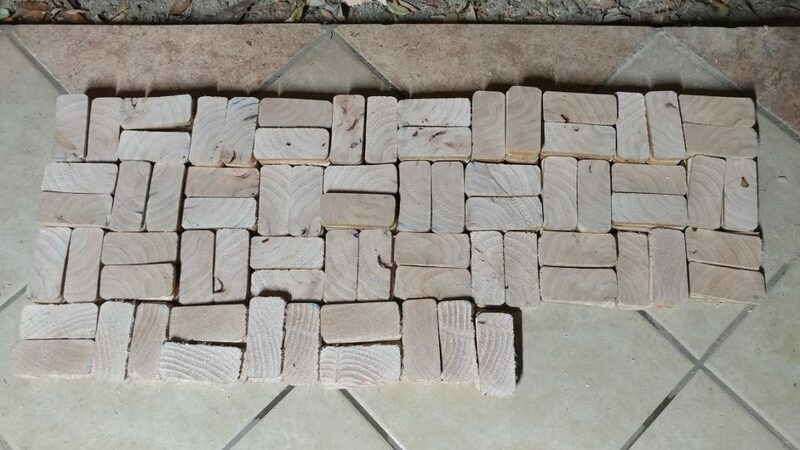 Of course I always do my own runtime tests with cordless saws and with the included pair of 5.0 batteries my copy of the XSH06 saw achieved only 364 and a half cuts into 2×4 lumber! What the? I don’t understand why it did so poorly in the runtime tests as it should’ve at least achieved around what the XSR01 did since they are both brushless motor saws and both were tested with brand new fully charged 5.0 ah batteries. I don’t believe the number I achieved should be correct but that’s what I got in my testing. One thing I will say is that I noticed that the battery closest to the motor had it’s light on the fuel gauge blinking at one bar while the other battery still had a solid one bar meaning that the battery closest to the motor drew more juice faster and ran out prematurely while the other still had some juice left to keep going. Unfortunately the X2 system needs two working batteries in order for the tool to run as you can’t run on only one battery. Just like the Makita X2 brushless XSR01 that came before it, the XSH06 too has top notch performance and can not only handle typical lumber cutting needs, it excels at them for a cordless saw. It really does have corded-like performance and aced all my 2×4 cutting performance tests including pressure treated, aced the 2×10 cutting test and even my extreme performance test in which the saw was subjected to brutal testing of cutting 5 layers of OSB stacked and glued together forming a 2-1/4″ thick x 24 inch long cut. This test nearly maxes out 7-1/4″ circular saws cut depth capacity at 90 degrees and only the toughest of the tough can survive. Long story short, not only can it achieve such a difficult cut, it can do so with one of the fastest cutting times beating out it’s predecessor the XSH01. 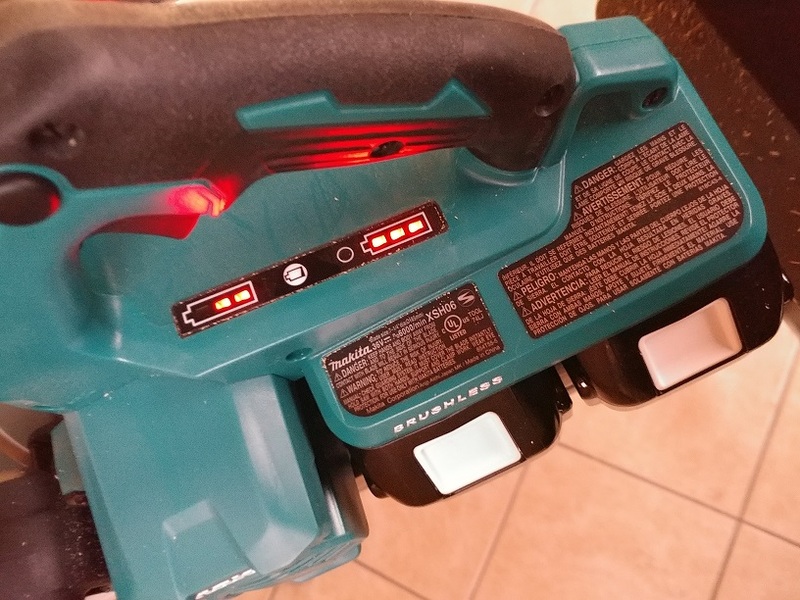 I also have a pair of Makita 18V 6.0’s on hand which do not come with X2 power tools and must be purchased separately but I wanted to test them out on this saw to see how it performs with larger capacity batteries and to see if they give it a performance boost. Long story short they do offer better performance but as you can see in the above video it’s so negligible that it’s almost a tie and hard to see with the naked eye when compared to the 5.0’s in the 5 layer OSB torture test cuts. Only if you go frame by frame can you see a one frame difference in cutting speed between both batteries. Also important to note is that this saw is equipped with both a dust blower to keep the line of sight clear of debris and a side dust chute that helps keep dust off the work piece when cutting. Both of which are excellent features when cutting. The XSH06 performance is on par with their rear handle X2 XSR01 circular saw which was impressive when that saw was released. While the XSH06 has top notch performance, it’s ironically bested slightly by the 2018 Gen 2 Milwaukee M18 Fuel circular saw which is an 18 volt power tool. The Milwaukee is more powerful but only slightly more so and not a day and night difference. What’s interesting about the XSH06 model when doing the 5 layer OSB torture tests is that if felt like it had more power to go faster but if you did push it faster it would push the motor over the limit and start to slowly hear the motor lose momentum and cause the overload protection to kick in and shut the tool down. I had this same exact experience with the Gen 2 Milwaukee model. Only the Makita XSR01 rear handle saw gave the user confidence to keep going and pushing without feeling like the motor was being taxed and was the only cordless saw I tested to inspire confidence to work in demanding cuts all day long without worrying about the overload protection shutting you down. Another thing I wanted to note was that many times the saws lower blade guard would get stuck on the material being cut and not open up preventing the saw from making cuts. This didn’t happen all the time but it did happen enough to get annoying. This can be seen in the first video above. The XSH06 model has a lot going for it including top notch performance that rivals corded plug in saws and is on the lighter side at 10.5 lbs for a heavyweight performing saw. It’s performance matches and keeps up with Makita’s own heavyweight the XSR01 rear handle saw and Milwaukee’s Gen 2 M18 Fuel model but is almost 2 lbs lighter than those two models. It also has a lot of things keeping this saw from being the perfect cordless saw or being recommended as it’s performance stamina doesn’t inspire confidence for heavy duty demanding cuts like it’s XSR01 sibling, it’s tested runtime left a lot to be desired, the lower blade guard gets stuck on the work piece every so often and it’s second handle could be bigger for added user comfort. Other things like its missing rafter hook would be expected on a saw of this price point. I’ve got both saws and I still find myself grabbing the XSR01 when I reach for a circ saw. For no other reason than it just feels like I’m doing something manlier. Ha! I did really like the dust collection update on the XSH06 and XSH04 especially for cutting in confined spaces. Hey, did you have the same issue with the lower blade guard getting stuck? You can see it at the end of the demo video. Also, were you able to get close to the rated 600+ 2×4 cuts Makita claims?